Draw character turnarounds, 1 pose per frame in the timeline. In this case, 4 poses. Drag each layer to the SYMBOLS directory in the Library. Delete everything on the current timeline, and drag the Symbols out of the Library onto stage. Because the Symbols were registered to the stage to begin with, they will all appear in their correct positions. Set Symbol pivots. eg, Hand to arm, arm to shoulder, etc. 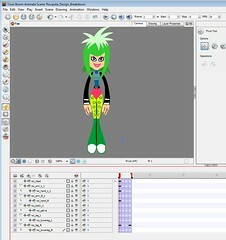 Select all layers and frames and drag to Library - the rigged character will be stored as a .tpl (= template) and can be reused in any scene. ToonBoom Animate has a z-axis in addition to x and y axes. When a character turns and the other arm goes BEHIND the body... instead of creating a new layer UNDER the body... you can keep the other arm on its same layer but change it's Z-AXIS position so that the arm goes under the body. This is really cool. I've just started using toon boom animate. You have a great blogg. Maybe you could help me with something.After draging each layer the SYMBOLS directory (6)all the symboles from the other poses appears as drawing substitudes from frame 1. I like this, but when I'm setting pivots (8)the pivot is the same in all the sustitudes. Are there annother way to this, so that the sustitudes has individual pivots?